We are done, finished, complete. Another year of maple syrup making under our belts and it was our largest haul to date. We collected approximately 200 gallons or 800 litres of sap which was transformed into an amazing 5 gallons or 20 litres of syrup. Yeah! Our trees ran well all week, producing approximately 100 gallons of sap. It was a sizable boil that was going to take some time and patience to reduce. 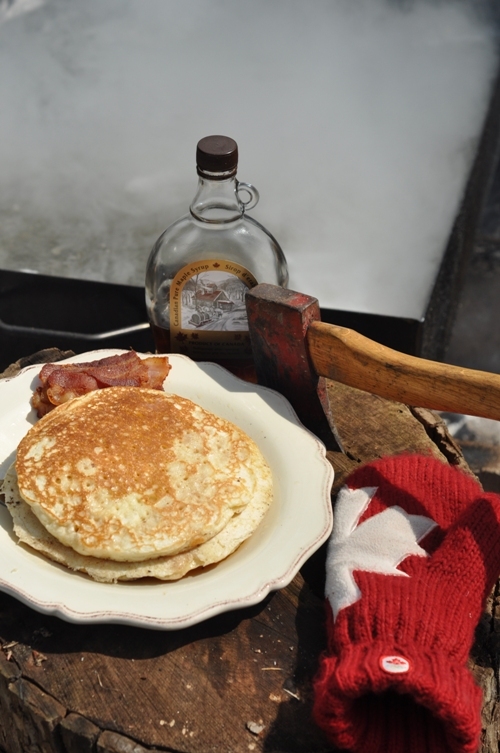 On Saturday, Matt made a delicious pancake breakfast (smothered in some of last years maple syrup) that we enjoyed in front of the warm fire. Things were going smoothly but we could tell it wasn’t going to be finished until the next day. Matt got up twice in the night to stoke the fire and I got up Sunday around 5:30 to get it boiling hard so that we could finish before the rain moved in. Our pan is the perfect size for finishing the amount of sap we collect from 20 trees. Outside, we brought our sap (now syrup) up to 218-219F, poured it through the wool filter into a large stainless steel pot, and brought it inside. It filtered quickly and we were certain this was going to be our clearest batch of the season. However, I’m here to report that we made one huge mistake that created the sugar sand deposits that are now present in every bottle. Inside, we placed it back on the stove and returned the syrup to 219F. It’s nice to hold it at 219F for a few minutes to thicken the syrup up but be careful not to let the temperature rise any further. Note: We always bring our filtered syrup inside and reheat or boil it to the finishing temperature of 7.1degrees F above the temperature of boiling water (for us approximately 219F). It is very difficult to be sure that it has reached the proper temperature in the large outdoor pan. The second reason we like to finish it inside is so we can be sure it stays as hot as possible during the bottling process. 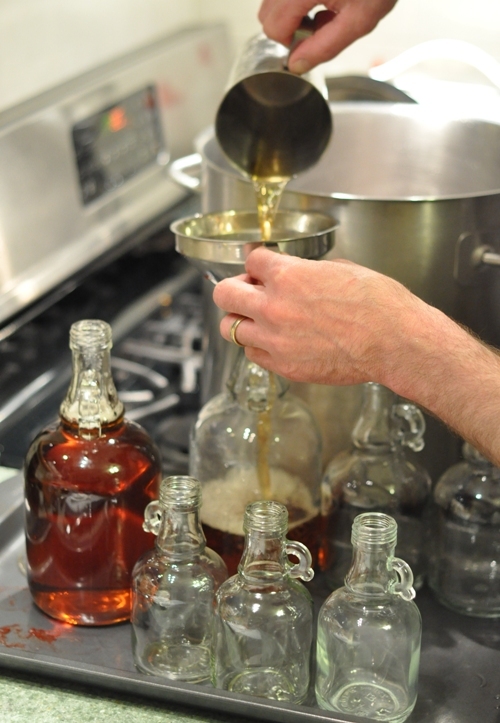 Bottling must be done quickly and efficiently because the syrup temperature must not go below 180F (this ensures sterilization and prevents mold). It reached 219F quickly, we held it at that temperature for a minute or so, and then laddled the syrup into hot (out of the oven) sterilized bottles. We didn’t know until much later in the afternoon that there was a bunch of sugar sand collecting on the bottoms. Why? How could this be? What did we do wrong? We filtered it through the wool clothe and pre-filters. Should we have used more pre-filters? Disappointed and determined to get to the bottom of this problem I went online and found that other people were having the same trouble. This is what we’ve concluded…after bringing the filtered syrup inside and returning it to 219F we should have re-filtered it. Why? Because more sugar sand or niter was created by bringing it to temperature. Sugar sand accumulates as sap boils. 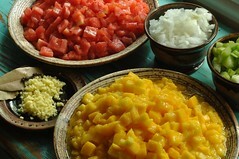 It’s a concentration of minerals and nutrients that collect as the excess water is boiled away. It is perfectly harmless and can be consumed. 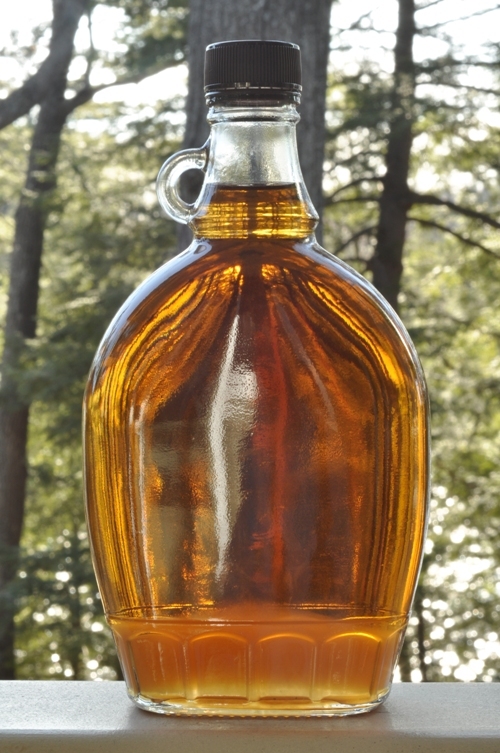 In fact, some maple syrup producers are unable to eliminate it completely even when using a filter press. But, after reheating it, we should have filtered it a second time before bottling. This is the one step we omitted and did so because we were confident that it was clear and well filtered initially. We didn’t know that by reheating it we were creating more niter. In the past, we have always filtered it again after bringing it up to temperature because our initial filters were so gunked up; not even realizing how critical this final step was in reducing the sugar sand or niter. Let this be a lesson learned. The one nice thing is this syrup is still really light even though it is our third batch. Usually, the final boil produces much darker syrup but all three of our batches were fairly light with this one being the lightest. Despite the sugar or sap sand floating on the bottom (and, it will settle in a week or two) it is as heavenly as the rest and will be enjoyed by family, friends, and neighbours for the next year! Kudos! Looks like a lot of hard work, but well worth the effort. The finished product looks amazing and an interesting lesson learned. Oh, yum! Sand be damned! Sugaring parties look like so much fun even though they’re hard work. We hope to start a similar tradition in the fall with cider pressing parties when our new press arrives! I’ve been making boiled cider syrup the past two falls. Tart/sweet and tasty! We’re having the same problem here this year with sugar sand, and we’re doing everything right, according to the books. So frustrating, to see it forming as it cools, when it’s sparkling clear when bottled. Have heard this may be a heavy year for sugar sand. Sigh. Our western Pa. efforts have been going on for 25 years. We have 20-25 taps and set our most syrup record last spring, 2012, 6 gallons. For years we struggled with the final filtering of boiling hot syrup at the canning stage. Even after doing that slow. tedious, hot step, we still would get sugar sand. We (my wife Deb and I) have settled into a new process the last couple of years. We do not do the pre-canning filtering. We have already filtered when we take the near syrup off the fire outside so it is clean. We can it and wait several days. The sugar sand settles to the bottom of the jars. We then open the jars, decant off the perfect syrup, leaving the gunky sand for non aesthetic uses like bread making, and then easily recan the pure syrup which is shared with family, friends and neighbors. An interesting physical understanding I learned this past year from my friend Gary is that when the jars seal, it is because the syrup literally shrinks. Expanded when hot, shrinks when cool, thus the vacuum seal. Cool! Two words: double boiler! 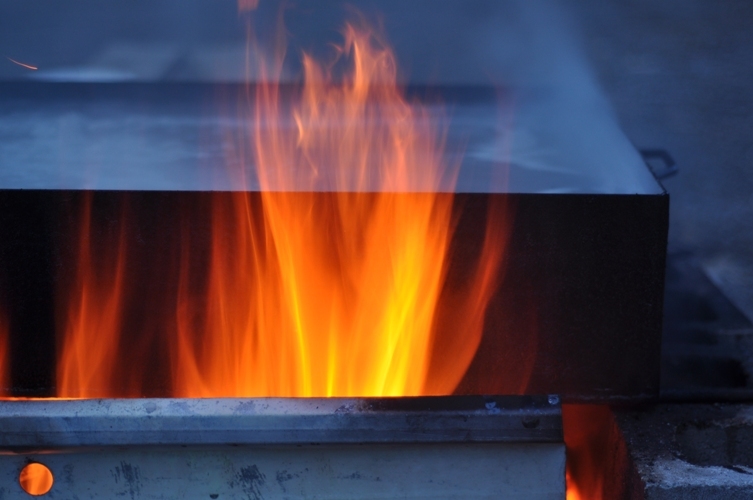 Heating the finished syrup to ~190-200 degrees, slowly and evenly, without boiling, is the key. We had the same problem, in that our wonderfully clear syrup, which we double (orlon) filter by the time we get to bottling, develops a small layer of nitre in the bottom of the bottle. So, invest in a proper water-jacket syrup heater with electric burner, or be patient during the process of a good-old double boiler on the stove/burner. I can say there is nothing more frustrating than working so hard setting up taps, emptying pails, starting fires, spending hours boiling down, finally filtering, just to have a final result that is cloudy. I myself have battled with this circumstance for quite some time and haven’t found the perfect solution. I may have to invest in a filter press or alternative type finishing system. Way too much effort gets put forth to end the process with a less than ideal product!! once brought to 4 above boiling we let our syrup cool and stand for a few days. During this time the sand settles after which we pour the clear syrup of the top. Then we re-boil, filter and bottle. 2014 was our first year trying this and it works! Sand free syrup.